Between Cala Moli and Cala Vadella, this stunning, modern hillside villa enjoys spectacular views of the sea, the islands of S'Espartar and Bledas, as well as the west coast of the island. 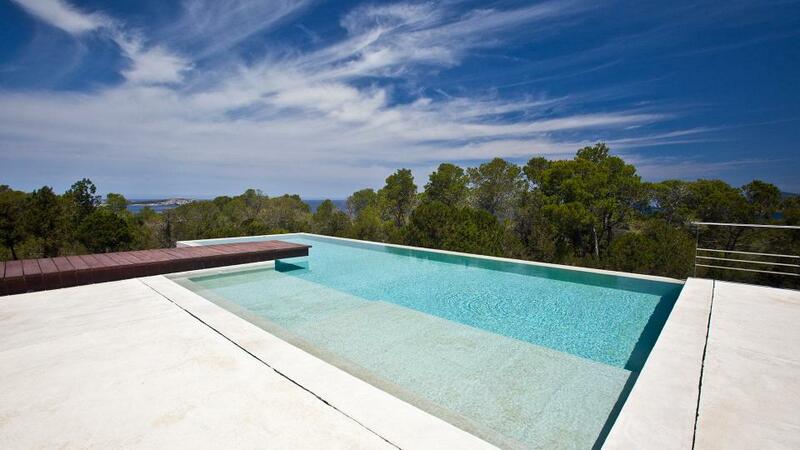 With a plot of 1.000 M2 totally fenced, the villa is a garden with Mediterranean vegetation and many open spaces. Room, Ground level, view of the sea. This bedroom has 1 double bed 180 cm. Bathroom ensuite, With shower. This bedroom includes also dressing room, private terrace. Room, Ground level. This bedroom has 3 single beds 90 cm. Bathroom ensuite, With shower. Room, Ground level, direct access to the courtyard. This bedroom has 1 double bed 180 cm. Bathroom ensuite, With shower. Room, 1st floor, view of the sea. This bedroom has 1 double bed 180 cm. Bathroom ensuite, With bathtub, shower. This bedroom includes also safe, private terrace. Room, 1st floor, direct access to the terrace. This bedroom has 1 double bed 160 cm. Bathroom ensuite, With shower. Living room and dining room with beautiful sea view, equipped with French satellite TV + Astra international. Access to the main terrace. Fully equipped modern kitchen with ceramic hob, dishwasher, fridge, coffee machine ... and dining area. The patio is converted into an outdoor living room and gives access to a roof terrace on the roof. Great panoramic views. Private pool 9 x 6 m.
Terrace very well furnished with deck chairs. Outdoor dining room protected by a sail. Outdoor kitchen equipped with dishwasher, fridge and freezer. Chill out in the garden. Outdoor parking for 3 cars. The house, completely renovated and equipped in 2013, is 5 minutes drive from the beaches of Cala Moli, Cala Tarida and Vadella, and just 5 minutes from the city of Sant Josep, service. Ibiza Town and the airport are 20 minutes away. - Advance payments can be made with the following payment method : Visa - Mastercard - Carte Bleue.